A new entry plaza and lobby pavilion greet Pacific Amphitheatre visitors. How does one embody the movement and energy of performance in a static form? 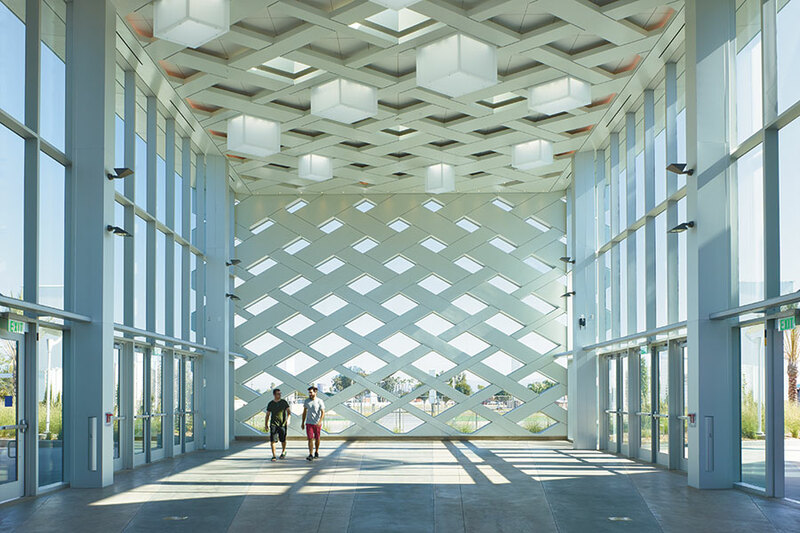 Jess Mullen-Carey and Bill Beauter of the firm Make Architecture conceived of a metal diagrid-patterned facade with a ceiling of extruded pendants and glass-covered skylights for the Pacific Amphitheatre in Costa Mesa, California, as a dynamic entry space. The result is a perforated metal skin that, much like a theater curtain, appears to float up from the ground. Originally built as a stand-alone facility on the 150-acre Orange County Fairgrounds, the Pacific Amphitheatre remained somewhat aloof from the rest of the grounds for most of its existence. However, after being shuttered in the 1990s and then reopened in 2003, the amphitheater’s enduring popularity necessitated a greater physical connection to its surroundings. Therefore, the entrance pavilion is both a focal point in the reorganized layout of the 120-year-old site as well as an official pass-through point for the fairground. 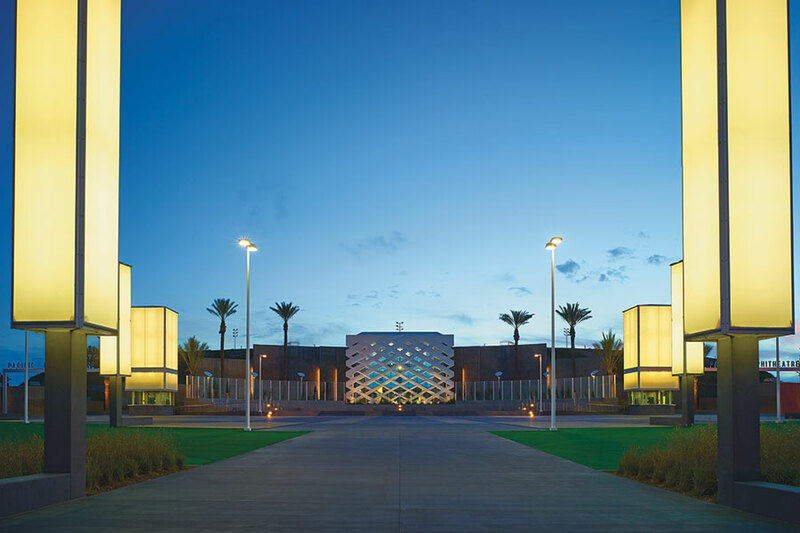 The entrance pavilion connects the 8,500-seat amphitheater with a redesigned 32,500-square-foot plaza, and the structure also meets the site’s sound-mitigation needs by creating an acoustical vestibule. “The connection and vibrancy of all that energy coming together is really what influenced us in wanting to create a skin that had that same sort of sense of movement and evolution,” partner Jess Mullen-Carey explained. 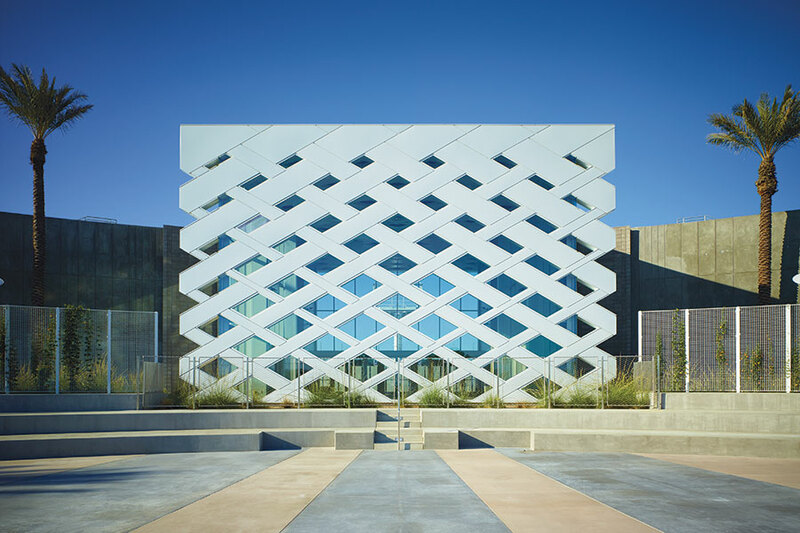 The process behind choosing the material for the skin was iterative; Make Architecture considered glass fiber, reinforced concrete, and precast concrete before selecting the budget-conscious yet endurance-oriented metal paneling. The design itself was conceived almost entirely in Rhino and features a progressive fenestration pattern that gradually develops from a four-foot diagrid. Although Mullen-Carey admitted that the basic concept of the diagrid was something the firm had worked with before, here he hopes that the form captures the energy of a live performance.